Author Tiziana Lo Porto has constructed a great book here. The press release for Superzeldastates that the majority of the dialogue is real, "extracted from novels, stories, letters and interviews, as well as statements made by their famous friends..." and, assuming this is true, what we have is a depiction of a powerful love fueled by art, ennui and alcohol. But the focus of this book is smack dab on Zelda, warts and all. Here we see an iconoclastic woman navigating her artistic sensibilities, her celebrity status, her vanity, her decaying marriage and her schizophrenia with a level of personal insight and enormous denial. The story covers both the abuses heaped upon her by her husband, as well as those she lathered him up in as well.Superzelda travels with the Fitzgeralds from Alabama to New York to Paris to Minnesota to Italy to Hollywood to Delaware to seemingly all the places in between as they are constantly seeking salves for their troubles, thinking a change of scenery would be all that was required. The first half of the book sets Zelda as beautiful, fearless, spoiled and wild which only adds to the pathos of her eventual decline. As Zelda unravels, you begin to wonder if her early effervescence was the cause of her mental illness or a result of it. In this book she comes across as the model for all of F. Scott's female protagonists -- after reading this book, it is impossible to read Daisy Buchanan as anyone other than Zelda. Artist Daniele Marotta also has done a great job of researching the clothing and cityscapes of the time period and his pages show this attention to detail. His style is loose and sketchy and everything is conveyed in black, white and blue -- the same blue throughout, adding a uniformity to the pages, but washing over so much of the detail. Unfortunately, it is Marotta's art that detracts from what is, for all intents and purposes, a great introduction to Zelda's life. For a woman so praised for her angelic beauty, Marotta draws one hell of an ugly Zelda. Her face morphs from panel to panel, so much so that sometimes you are not even sure that it is her. Tightly detailed background renderings are juxtaposed with blobs of ink to suggest the people among them, and everyone has the same angry look even while they are smiling. And then there is the blue. So much of the blue. Everywhere. Too much. 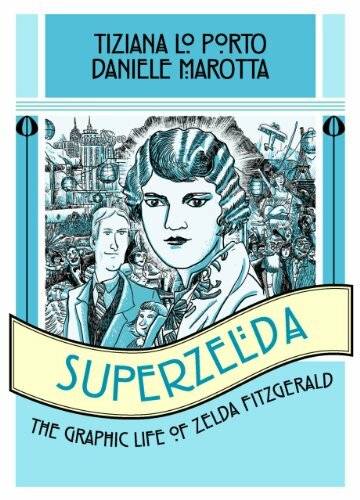 Still, Superzelda: The Graphic Life of Zelda Fitzgerald accomplishes much of what I assume the creators set out to do. It brings to life the biography of Zelda, adds to her mythos and humanizes her at the same time. It explores complicated issues of love, art, alcoholism and mental illness while giving voice to a person powerful and self-confident enough to deal with them head on. At 176 pages, it serves as a great introduction to the Fitzgeralds and to Zelda specifically, and, as this year's Fitzgerald Frenzy begins, it gives you just the right sense of how to be both beautiful and damned as you dance tenderly in the night on this side of paradise. During the eventual conversations you are bound to find yourself in about the Fitzgeralds, it will keep you from being a great gasbag. Yea. I just did that.